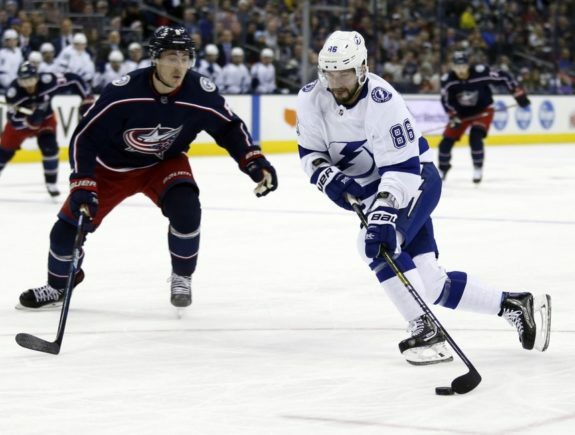 The NHL’s Department of Player Safety (DoPS) announced on Saturday that Tampa Bay Lightning forward Nikita Kucherov has been suspended for one game for boarding Columbus Blue Jackets defenceman Markus Nutivaara during Game 2 of their first-round series in Tampa on Friday night. 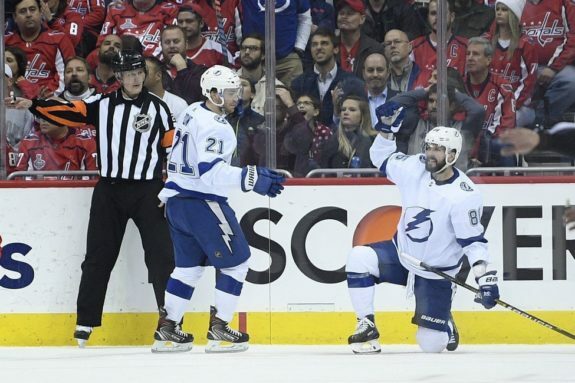 The incident in question occurred at 15:34 of the third period when Kucherov hit Nutivaara who had fallen and was in a vulnerable position on his knees along the boards. Kucherov was assessed a major penalty and game misconduct for boarding on the play. Kucherov – who led the NHL in points this season with 41 goals and 128 points – didn’t miss a single game through the regular season with the Lightning. That said, he was no stranger to the penalty box either during his 82-game season with 62 penalty minutes to go along with his incredible offensive numbers. With the Lightning already down 2-0 in the series and heading back to Columbus for Games 3 and 4, they will have to look elsewhere for offence if they are going to pull out a win in Game 3. The loss of Kucherov could put the Lightning in a tough spot as he failed to get a point in just 20 games this season with the Lightning coming out on the winning side in just eight of those contests. That will mean that Tampa will rely heavily on their depth going into Game 3 – guys like Steven Stamkos (98 points), Brayden Point (92 points) and Yanni Gourde (48 points) who were the next three highest scoring forwards for the Lightning during the regular season. Dark Days for the Lightning? After an incredible regular season for the Lightning, who finished the year 62-16-4 with 128 points, the Presidents’ Trophy winners are on the verge of a first-round upset at the hands of the Blue Jackets (47-31-4). For a team that finished the year with a goal differential of plus-103, the Lightning have struggled so far in their two playoff games – aside for the first period of Game 1 – to find the net in behind Sergei Bobrovsky. Now, with Kucherov watching from the press box for Game 3, the Lightning are at risk of falling into the depths of a 3-0 deficit in their series. So far, the Blue Jackets have been able to shut down Tampa Bay stars, holding Kucherov, Stamkos and Point to zero points and a combined minus-seven through the first two games of the series. And the lack of production is clearly frustrating the Lightning forwards. Can Lightning Strike Twice in Columbus? While the Kucherov suspension will certainly be a blow to the Lightning up front, Tampa will have to pull out all the stops in Game 3 if they hope to have a chance at coming back in this series. Related: Bolts on the Brink – Can Lightning Salvage Historic Season? They will rely heavily on their depth up front and their depth on the blue line if they are to come away with a win in Game 3, with a lot of the pressure riding on Andrei Vasilevskiy to steal one for them on the road. While the Blue Jackets have taken over the role as the favourite to win this series, the Lightning have shown resilience all season long in maintain their spot atop the NHL standings. Get by Game 3 and Kucherov will be back in the lineup – likely more determined than ever to help his team get the victory. Otherwise, if they can’t pick up the win on the road, the top seed in the East could be staring down a 3-0 series deficit with the Blue Jackets looking ahead to the winner of the Bruins-Maple Leafs series.